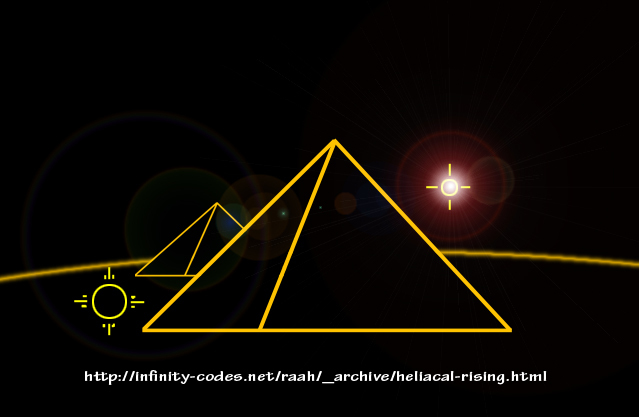 The Egyptians used Sirius as one of their main time markers for measuring cosmic cycles there can be no question of that. During the time of Egypt's height of culture there was a synchronicity in the reoccurance of the star Sirius rising heliacally after the Sun. From the date Jul 16th 7162BC to Jul 16th 5701BC exactly 533265 days elasped, the dates being exact days of an occurrance of the helical rising of Sirius before the Sun. The Egyptian time matrix it is stated commensed with the 1st month of 30 days at the time of the helical rising Sirius, and would have be kept aligned by tracking the occurrance of the helical rising in the future. However over time the synchronicity doesnt remain the same it changes, as there arent 533265 days between the occurance of the helical rising of Sirius today. The current cycle started from the date Aug 1st 1599AD and continues until Aug 15th 3059AD, the number of days between them being now 533268, which is 3 days more than the standard 533265 days.